Effective content can have a variety of characteristics. It can be visually appealing, intellectually challenging, or otherwise engaging. It might be promotional or published solely for entertainment value. There is only one common thread that links all forms of effective content. Ultimately, it is a tool that is used to help you connect with your audience. Content marketing is a bit like dating. If you don’t understand your audience, not only will you fail to connect with them, you might even offend them unintentionally. Check out your competitors’ social media pages and see what kind of content they are sharing. Find brands that are selling products and services that your target audience likes as well to check out their content offerings. Look at consumer review pages such as yelp or Amazon to get a feel for your target audience members’ concerns and interests. Determine which social media channels interest people who consume your products and services. Create profiles for customer personas that begin to emerge while you do your research. These should include demographic information as well as hobbies and interests. Once you are finished, you should have an idea of the social media channels your audience uses, their interests, the type of content that gets their attention, and a variety of other information that you can use when determining what kind of content to provide for them. One sure way to connect with your audience is to ensure that they continue coming back to read on a regular basis. This can be accomplished by writing content that is both relevant and newsworthy. If you become a trusted source of current content that is relevant to your niche, you will begin to earn subscribers and return visitors. This gives you repeated opportunities to connect with these audience members. The majority of people are visual learners. This means that they will retain and understand the content better if it is presented in the visual form or if it is enhanced by visuals. In addition to this, images trigger emotions. Visual content can be pictures, photographs, memos, charts, graphs, and videos. If you haven’t been creating or sharing infographics, now may be the time to begin. It has been proven that sharing infographics result in the most social shares and other forms of engagement. We know longer live in a world where people are willing to wait to consume information. People are continually checking their smartphones and other devices for news and messages. If your audience must wait for you to publish blog posts to hear from you, it can be difficult to truly connect with them. Because of this, you might consider using options that allow you to connect in a more up to the minute way. One possibility is to become active on Twitter. This will allow you to share your thoughts with your audience on the fly and in short bursts. Frequent Facebook status updates are also effective. Essentially you want to stay in your audience member’s ears. You might also consider using a plugin or other utility for your blog or website that enables you to stream content directly to your audience through a feed. Many brands are finding success in connecting with their target audience by using meerkat, Facebook live or periscope to stream live videos to their followers. What do you know and what can you do? The answers to these questions are extremely important because they define what you and you alone can provide to your audience that others cannot. Your unique knowledge, perspective, and views are what your target audience needs in your content. 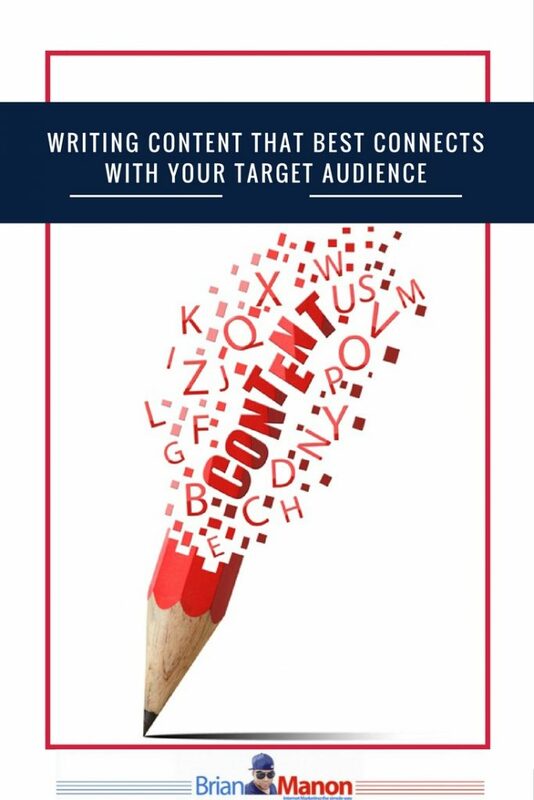 You don’t have to write content that is consistently agreeable to connect with your audience. Showing that you are knowledgeable, helpful, and opinionated at the same time will get your readers to see you as a leader in your industry. Maintaining high standards of content quality is extraordinarily important. Factual errors, spelling and grammar mistakes, and other issues that show that content has been sloppily thrown together can have a real, negative impact. After all, if you cannot be troubled to get a few paragraphs of content right, how can your audience trust your products or services. Apply the highest quality control standards to the content that you create. If you are overwhelmed with a high volume of content demand, you might want to consider a content writing service that provides copywriting services along with opportunities to get academic help. These services often include editing and proofreading services for business-related content. Never ignore engagement from your followers. This is where you can turn a bit of interest and attention into long lasting customer relationships. It is extremely important that you respond to questions and comments, thank people for liking and sharing your content, and reach out to active followers on social media. Of course, in addition to building great relationships, paying attention to audience engagement is a great way for you to determine which content is really making an impact on your audience members. This can help you to determine the types of content you will want to share in the future. If you are like most people, you have probably liked and shared touching or inspirational stories on social media. These may involve children, animals, people overcoming adversity, stories of ordinary people doing heroic things, and people simply being good to one another. You may have also shared stories that made you angry and stories that made you laugh out loud. This is because content that stimulates high order emotions such as anger, joy, or laughter earns engagement. It is also very effective when it comes to getting people to answer your call to action. If you want your content to connect, you have to write content that touches people in every part of the customer journey. This includes people who are just becoming familiar with your brand, long time loyal customers, and audience members who are returning to you after a long absence. This is why sharing a variety of content that includes posts that tell your story and introduce your brand, product descriptions, news based content, instructional videos, and reviews. Basically, you want to have something to offer to folks no matter where they are in the sales funnel. The entire purpose of content marketing is building relationships and earning trust. The only way to do this is to serve up content that facilitates an emotional connection between your brand and your target audience. Malia Keirsey is a young and ambitious guest contributor from Chicago. She likes to write about blogging, content marketing, and web design. Follow @MaliaKeirsey on Twitter or Facebook. Great tips here! Especially the one about hitting the emotional sweet spot! Tough to do, but by far the best way to connect with readers! Excellent tips here. Always looking for ideas and guidance in this direction.